What is Meridian Energy Reading? In the core of Traditional Chinese Medicine, there are 14 Meridians that runs throughout the body. Their function is to provide transportation of Qi (The energy force) and Blood (Nutrients). Each meridian is named after specific organ like Stomach and Liver, however, SanJiao and Pericardium is only to be described in Traditional Chinese Medicine. They travel through the organ that they are named after, but they also intersect with each other to form a network throughout the body. When the channel(s) is(are) obstructed, illness or discomfort will start to occur such as pain, stress, lack of energy, or insomnia. 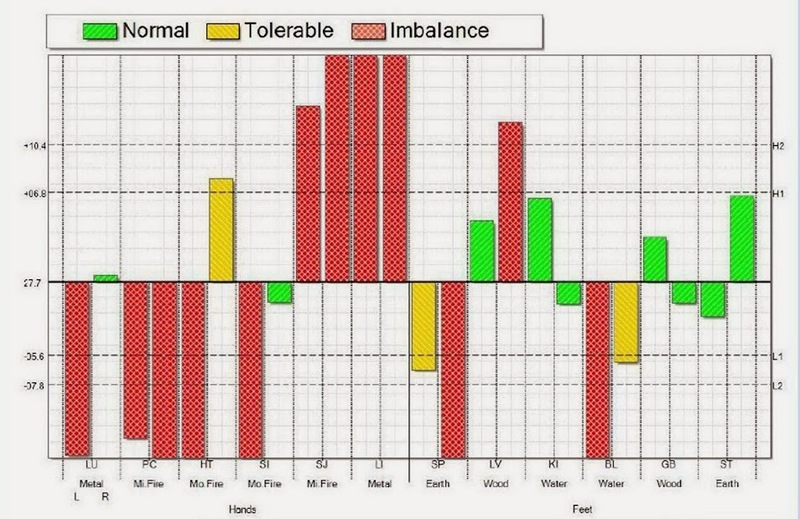 By using a device called EMAS (Electro Meridian Analysis System), we can clearly identify which Meridians are abnormal and imbalanced, and use acupuncture or herbs to adjust the imbalances to get you back to the healthiest condition! learn more about your EMAS chart!